See Napa Valley from a fresh perspective. Relax on a 50-foot Catamaran Yacht as you enjoy a 4-course meal by Tarla Grill and Chef Kadiye. 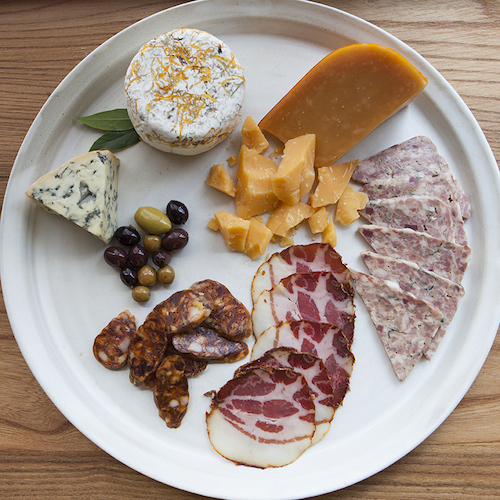 The owner and winemaker of AUM Cellars will be aboard to pair his wines with each course of dinner. You will enjoy a delicious dinner and a personal tasting with a charming winemaker while taking in the beautiful views of Napa. The Napa River will reveal history, ecology and agriculture. Along the river banks, you will find vineyards, cows, birds and have distinct views of the Mayacamas and Vaca Mountain ranges. There are no other businesses that provide a view from the Napa River. 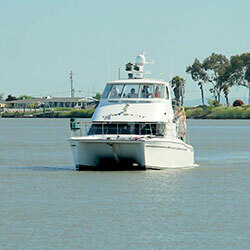 The Napa Valley Wine Yacht provides excellent hospitality while you relax and enjoy. Don't forget your camera. The scenery is relaxing, beautiful and worthy of frames at home. Enjoy local cheese, scallops, heirloom tomatoes in a Greek salad, halibut, ribeye, fresh garden vegetables, and flourless chocolate cake while you relax on the water. Chef Kadiye is a graduate of the acclaimed Culinary Institute of America. Experience small production wines that are organically grown while getting to know the winemaker and his unique winemaking techniques in this beautiful, natural setting. Aum Cellars makes interesting blends that you probably haven't tasted before, but you will be delighted when you do. Cruises booked upon availability and time of cruise based on tides. This tour is 3 hours. 6 - 12 guests. A minimum of 6 guests is required for a trip to run. Casual and chic. Don't forget sun protection and sunglasses. The yacht has plenty of indoor spaces, so cruises are available rain or shine. Tax is included, feel free to tip your Captain and crew at your discretion. Relaxing and fun at the same time. This experience can be enjoyed by friends, family or business team building. You will be given an opportunity to order wines. The Kiwi Cat is a 50’ power catamaran built in New Zealand for shallow draft and stability. The Wine Yacht is designed for entertaining and hosting events and wine tastings in the romantic setting of wine country. Built and designed by one of New Zealand’s most prolific catamaran designer/engineers, Alan Wright and Angelo Lavronos of New Zealand. The hull was designed for 3’ to 5’ seas to provide efficiency and enhanced platform stability for the 1999 and 2003 New Zealand America’s Cup Series. This vessel carried the Gyro-cameras for the Louis Vuitton series and AC finals providing excellent efficiency, speed, decreased roll and stability. It now lives in Napa. Guests must be 21 years of age. Dates and times of cruise are determined by tides. I wanted to surprise my wife for her birthday with something we had never done before. We had a total of 12 friends out on the yacht. She was surprised and we had a great time! Thank you to the Napa Valley Wine Yacht for all you did to make my birthday party such a success! We all had an incredible time. The food and wine presentation were amazing. The back deck even turned into a dance party! 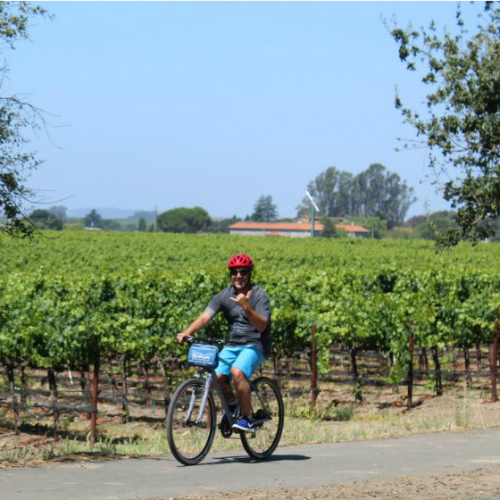 Our group of colleagues were looking for a few activities in wine country. We had several meetings and events over 3 days, but the most popular was our trip on the wine yacht. It was relaxing and easy. Our group showed up and everything was ready for us: food, wine, views and information about the Napa River. What a great time we had! The team who took our group out is very professional and hospitable. We had a great time. We have been to Napa many times, but this was a new perspective. The wine was great, the views are beautiful and we will do it again. The Napa Valley Wine Yacht is one of the most relaxing ways to experience the Napa Valley, and definitely the most unique. A leisurely cruise aboard the very comfortable 50-foot catamaran allowed us to experience views and Napa history that can only be seen from the water. In addition, we tasted and learned about the tremendous wines from Herb Lamb Vineyards alongside a beautifully catered meal of braised short ribs and wild mushroom risotto by Tarla Grill. The yacht was very spacious and with a limit of only 12 people on board, there is plenty of room to spread out on the bow, stern or relax in the cabin. You can even sit up with the captain and get the view from above! If you want to experience the world renowned food, wine and beauty that Napa Valley offers in a relaxed, intimate setting, a cruise aboard the Napa Valley Wine Yacht is perfect!